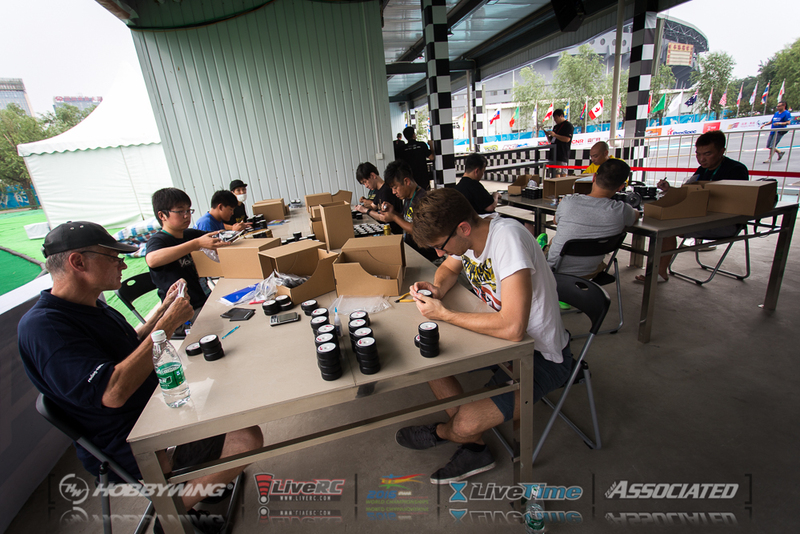 The IFMAR World Championship for the International Scale Touring Car category begins with the first of two days of practice on Wednesday morning, as the fastest electric on-road racers in the world head outside to the purpose-built asphalt course on-site at the Fengtai Sports Center complex. 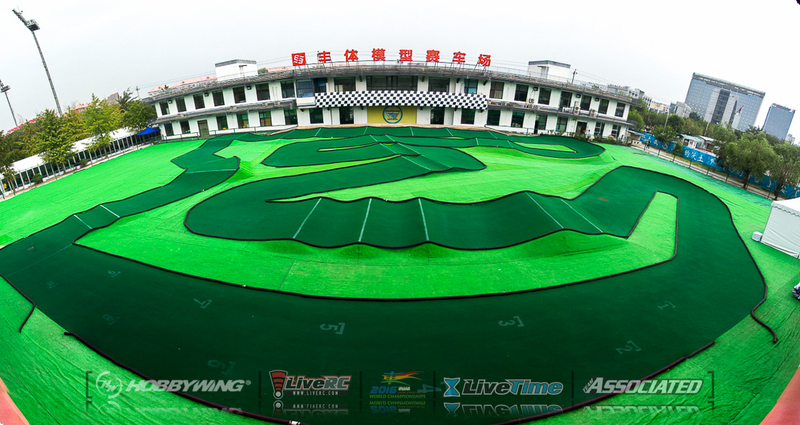 And like the temporary carpet track built in one of the compound’s arenas, it’s truly first-rate. 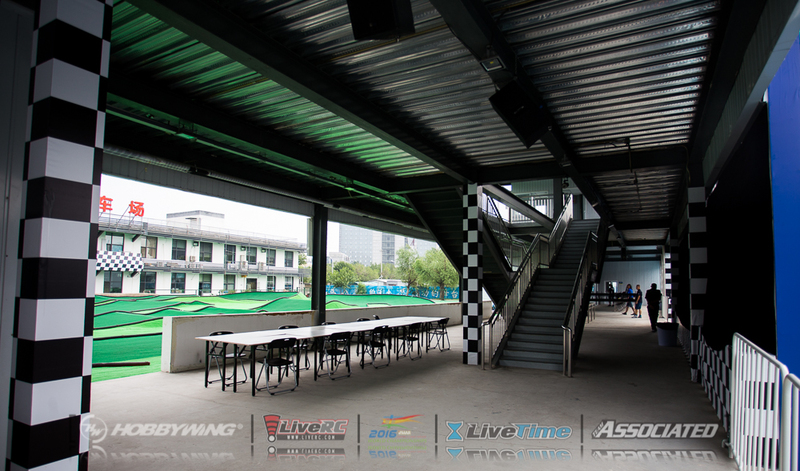 The massive track and drivers’ stand (with two enclosed rooms on top) was built in September 2015, and the asphalt was re-paved two weeks ago in preparation for the race - China’s first RC car world championship. 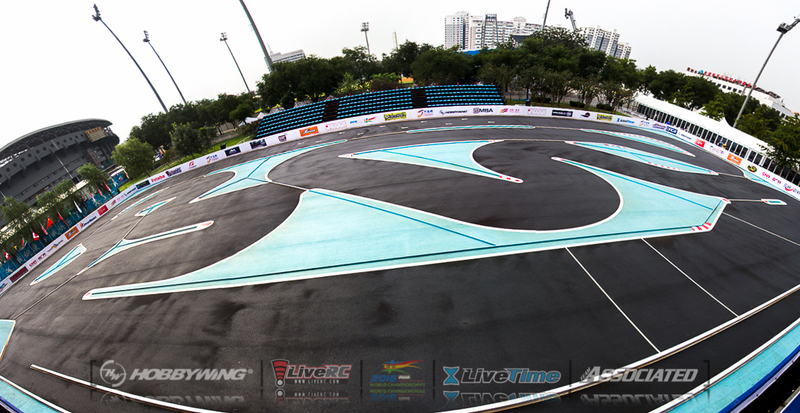 The huge asphalt track runs counterclockwise and measures 38 x 68 meters (125 by 223 feet), with 16 turns - 9 to the left, 7 to the right. 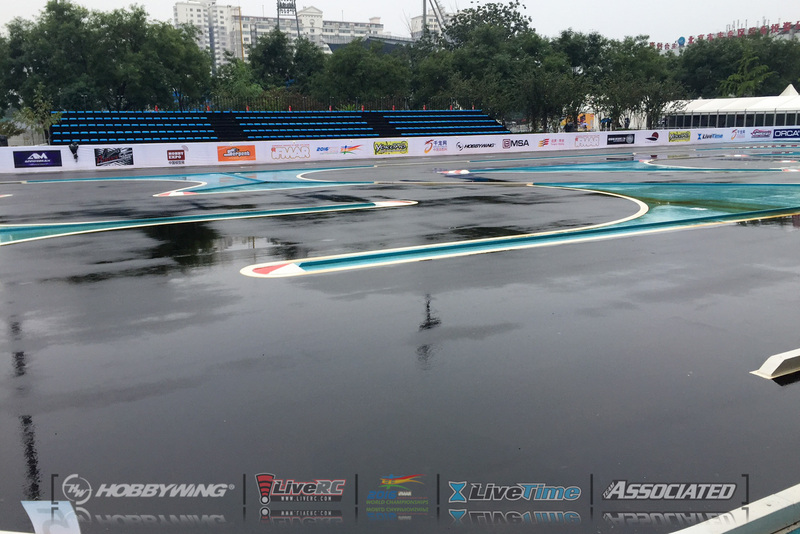 No cars touched the track following the resurfacing, but there will be races hosted here after the Worlds - as well as on the astroturf off-road track on the opposite side of the drivers’ stand. 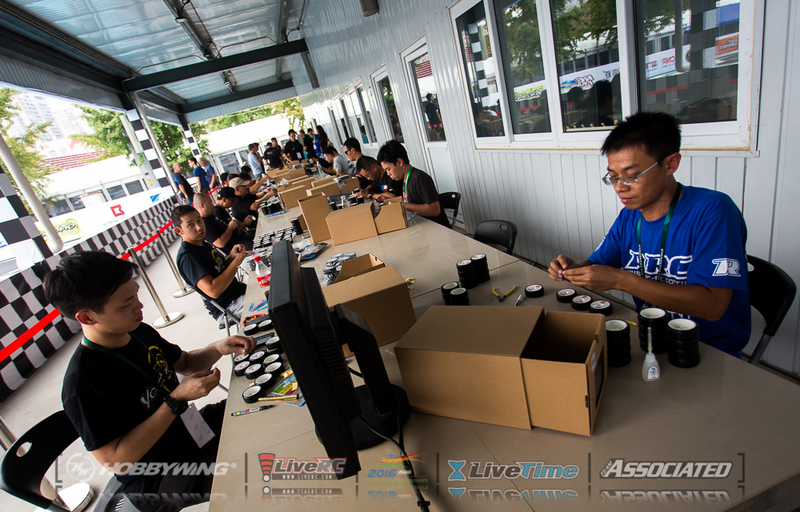 There were more than 150 drivers registered for the event, to ensure that a full field of 15 heats will compete this week. 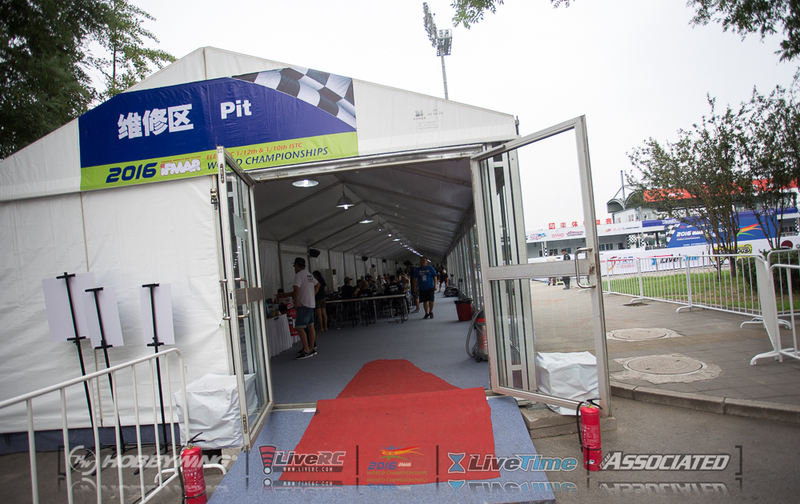 However, there are 220 pit spots in the temporary building set up off to the side of the track to accommodate mechanics and team managers. 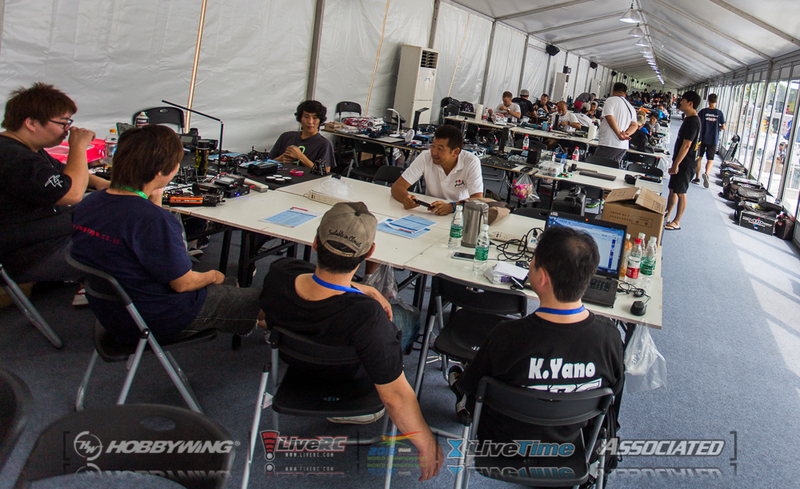 The building, like the rooms allotted for the race officials, tech inspection, and media are all air-conditioned. 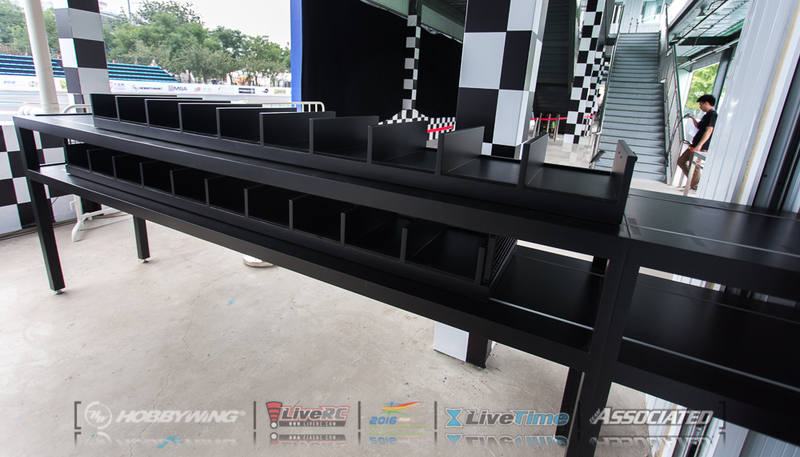 Speaking of the tech inspection room, there are two shelves extending from one of the door ways with sliding shelves to facility entry and exit of vehicles. Great idea! 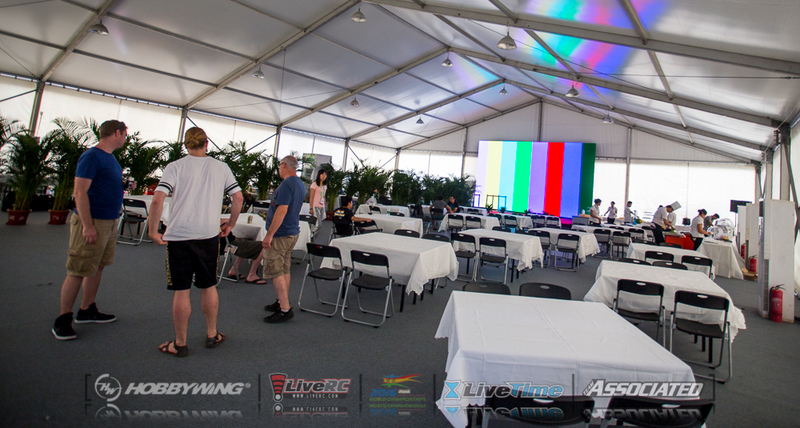 There’s a banquet area, too, where the racers and teams can eat at any time. 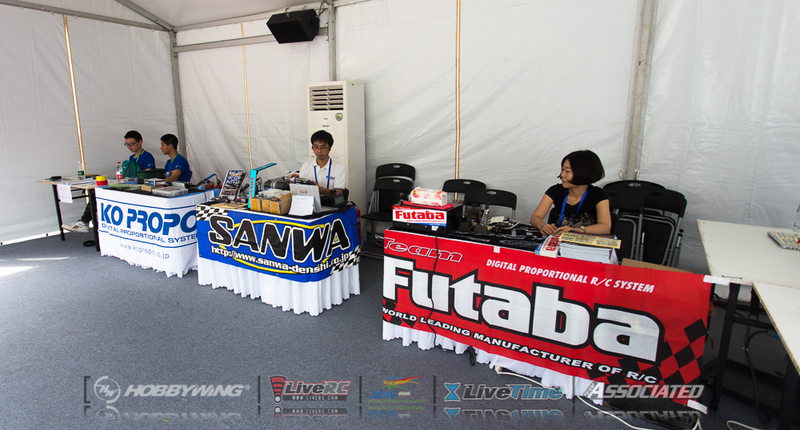 Manufacturers have set up tables and tents throughout the track area to provide support and advertise their products. 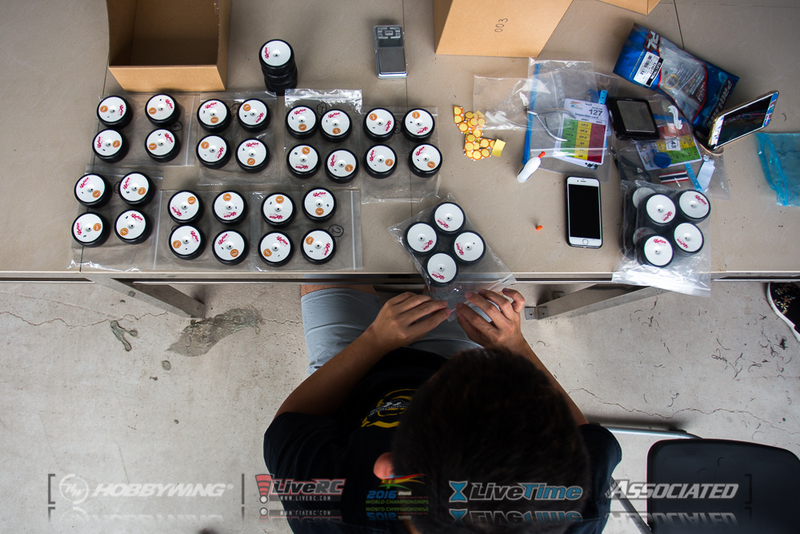 Need your transmitter or servo serviced? 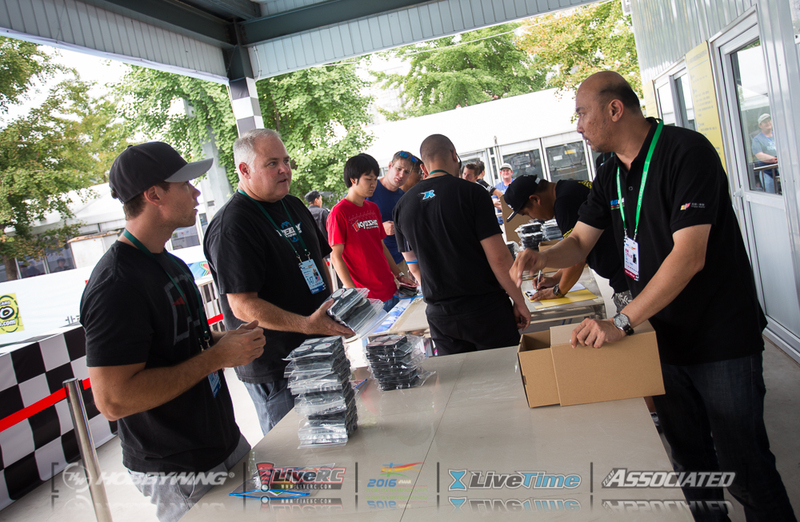 Though today is scheduled as a “day off” from the racing program, the pits at the asphalt track were full as racers registered for the ISTC event, performed any last-minute preparation on their cars, and began mounting tires - the spec tire for this week’s competition is the Sweep Racing ESP-36R2PG slick. Unless, of course, it continues raining as it did today. 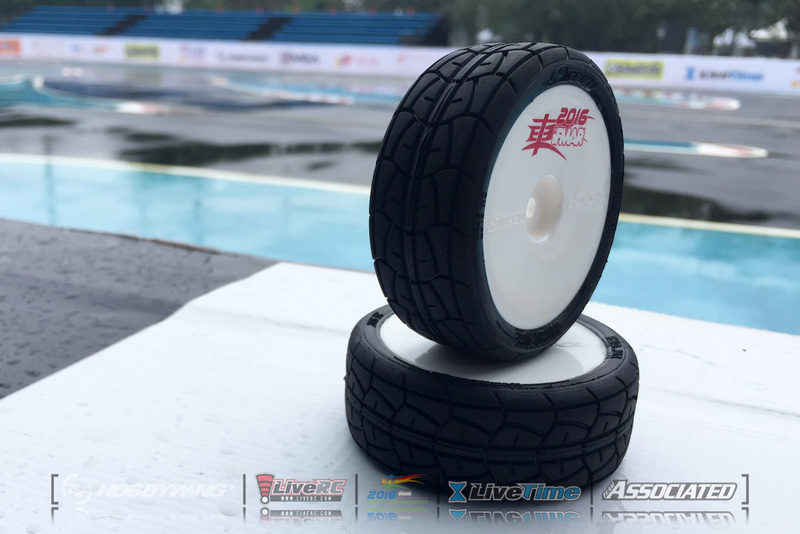 In which case, the racers will use the Sweep Racing EXP-WT treaded tire. 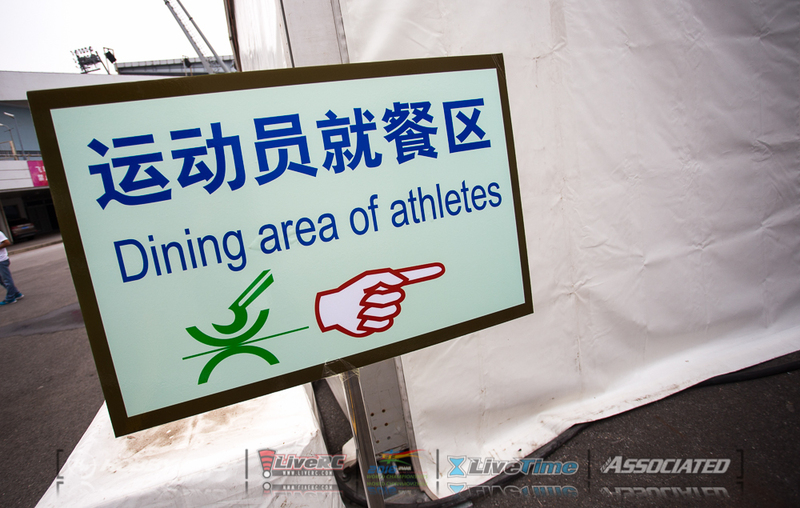 A billboard located on the grounds of the complex - and visible from the surrounding area, including a major highway - was used to advertise the event to potential spectators. 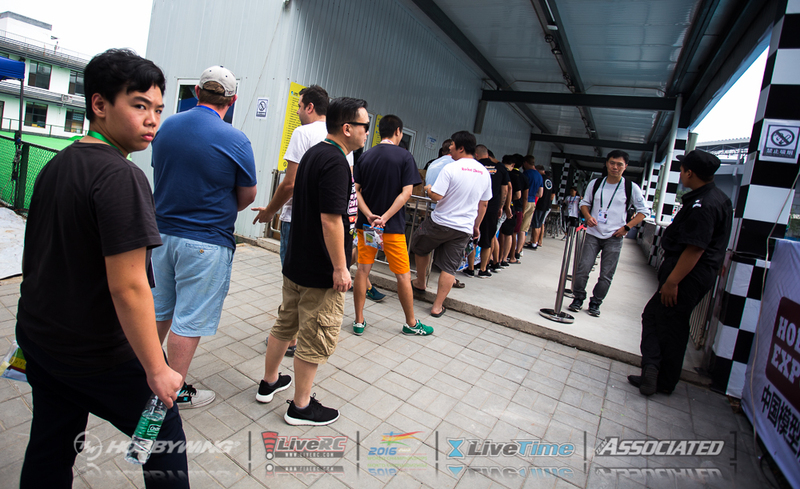 Local TV and print media will also attend opening ceremonies on the August 25, with hopes of attracting a crowd to fill the 345 seats in the grandstands. 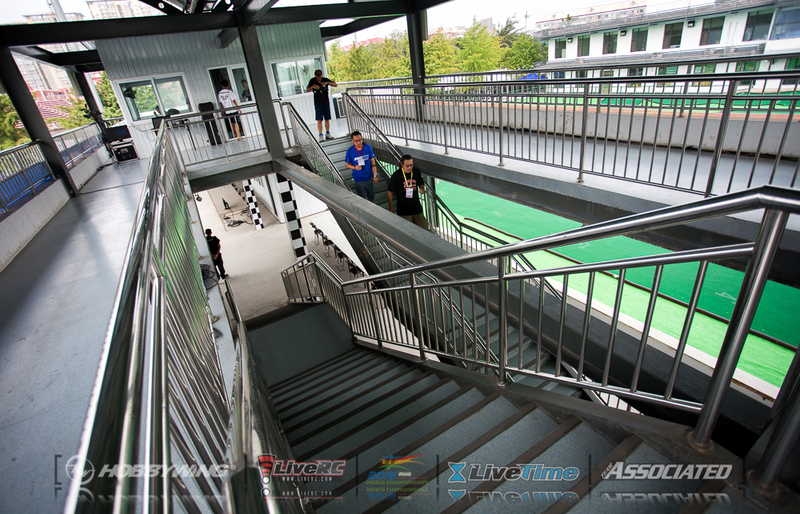 There’s even a separate sound system for the track and spectators - and a crew of 30 employees to make sure the event runs smoothly.